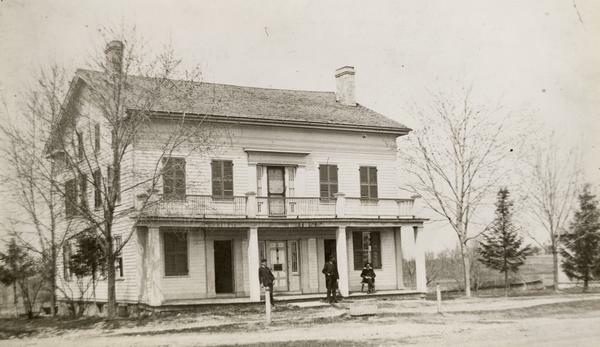 Upon opening the Hawks Inn in 1846, Nelson Page Hawks became one of DELAFIELD’s most prominent early settlers. Born in 1803, the entrepreneur transplanted his family to Wisconsin Territory from upstate New York in 1837 after working as a cabinet-maker, mechanic, inventor, merchandiser, and stagecoach manager. Following a brief stay in Milwaukee operating the Fountain House Hotel on West Water (now Plankinton) and Second Streets, Hawks moved his family to present-day WAUKESHA COUNTY in 1841. While running the inn, he sought new investment opportunities, including a nearby sawmill and Mississippi River steamboat. Hawks remained a Delafield resident until his death in 1863, serving farmers, merchants, and other passers-by travelling to and from Milwaukee. ^ “History of Delafield WI,” Hawks Inn, accessed February 25, 2013. ^ “Writings of Nelson P. Hawks,” Hawks Inn, accessed July 7, 2016. ^ Milton J. Bates, “The Mill on the Bark: Despite the Ravages of Fire and Time, Nelson P. Hawks’s Old Mill Survives Intact,” Wisconsin Magazine of History, Summer, 2001, 7. ^ “Early Day Taverns,” The Watertown Times, December 27, 1915. Still, Bayrd. Milwaukee: The History of a City. 2nd ed. Madison: The State Historical Society of Wisconsin, 1965, 99-100.